We are in the woods behind the Chernobyl plant when the dog runs at us. It is thin, with brindle fur and yellow eyes. Igor, our guide, makes a lunge and clamps his hands over its snout. They wrestle in the snow and icy water shakes from the trees. The dog’s eyes flash as Igor grabs a stick and throws it into the trees. Distracted, the animal chases it and our little group is free to move. But the dog reappears and drops the stick at Igor’s foot. He throws it again. The dog brings it back. I almost laugh with relief. …Nadezhda Starodub, a guide with the Chernobyl tour specialist Solo East, says the visitors (there are no “tourists” in the zone) love the dogs. 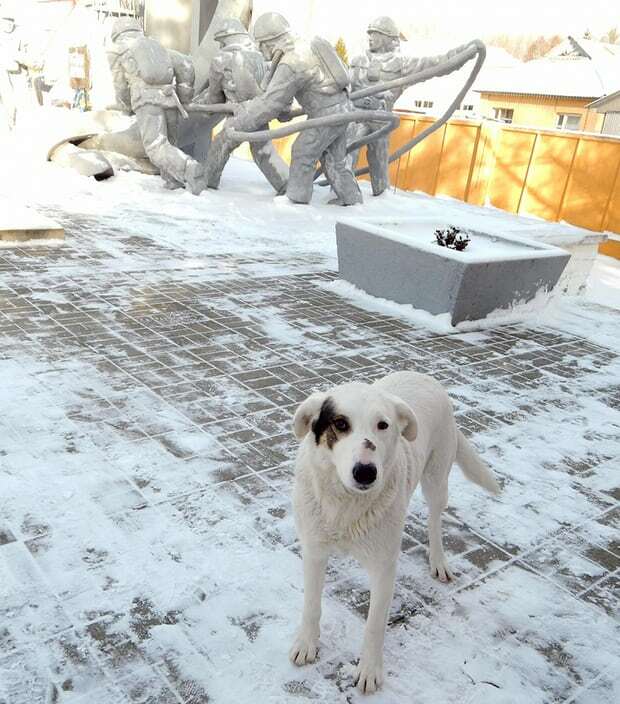 “Most of the time people find them cute, but some think they might be contaminated and so avoid touching the dogs.” There are no rules that forbid a visitor from handling them, but Nadezhda asks her charges to exercise the same common sense they would when approaching any stray. “Some guides are afraid of complaints,” she says, “so they try to avoid the dogs to stay on the safe side. But I love them.